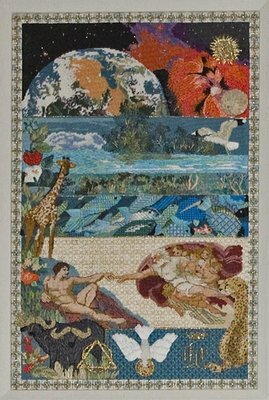 In creating my piece for the Academy which is now in the Gregg Museum of Art and Design, I chose to illustrate the oldest religious story, the story of Creation as printed in Genesis. The days of the week of creations are loosely laid out in horizontal stripes on 23 count Congress Cloth. The original design plan was for vertical stripes, but in the end, the vertical orientation was not wide enough for the desired images. The needlepoint is 14″ tall by 9″ wide, stitched in silk, floss and metallics. Beginning at the top (creation of Heaven and Earth) an exploding nova photographed by the Hubble Telescope shows the heavens. The Earth is taken from a photo by Astronaut Joseph P. Allen as he headed to the moon . Notice the ultra-suede moon to the right. The Earth shows the Mediterranean Sea and North African Sahara Desert. The second band shows the separation of the land from the waters and the creation of the firmament. The waters were gathered in specific places and dry land appeared. Vegetation also emerges, hence the mangrove trees, undersea grass, strawberries, leaves and flowers on the left. The fourth day mentioned the moon and stars which I combined with the other heavenly bodies at the top. The fifth day brought the fish and animals under the sea and the birds. The sixth day brought the land animals. I chose the Cape Buffalo to represent all cattle, and the giraffe and leopard as they are my favorite animals. The sixth day, God said “let us make man in our own image”. I used Michaelangelo’s “Creation of Man” from the Sistine Chapel ceiling. It contains one of the few representational images of God in Christine Art that is not totally symbolic. Finally, for the “Day of Rest”, I chose traditional signs of the Trinity: God the Father, the Dove of the Holy Spirit, and the monogram of Jesus Christ, crowned in victory (IHS). The entire piece is bordered with a blue, white and gold motif. I consider this piece one of my best and most intricate designs, but it was also one of the most spiritual and thought-provoking exercises I have ever participated in.